Everything you want in a Smoky Mountain getaway and a Pigeon Forge vacation rests tucked away in Bear-rific View. Exquisite natural lighting flowing in through the tall, impressive windows overlooking the mountains creates a dreamy outdoor atmosphere in the comfort of your secluded 2-bedroom cabin. 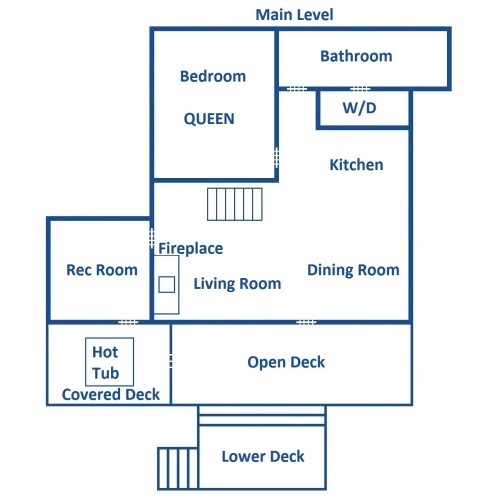 A large, open common room housing the living room, kitchen, and dining area encourages fellowship and memory-making while up to 6 guests cook, relax, and snack, all within distance of conversations and laughs. Mt. LeConte rests majestically in the distance, visible from your outdoor hot tub on the covered patio and your open-air balcony just steps away from the master bedroom. 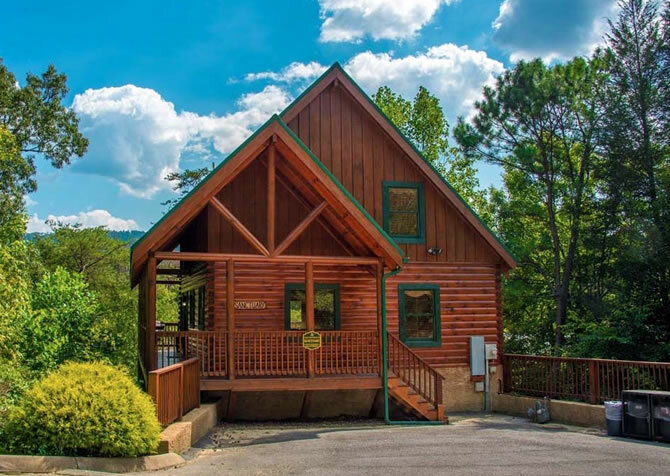 While there are hundreds of exciting attractions, shops, and museums to explore a short drive from Bear-rific View to downtown Pigeon Forge, rest easier coming back each day to cozy cabin furnishings, king and queen-size beds, and flatscreen TVs in each room. 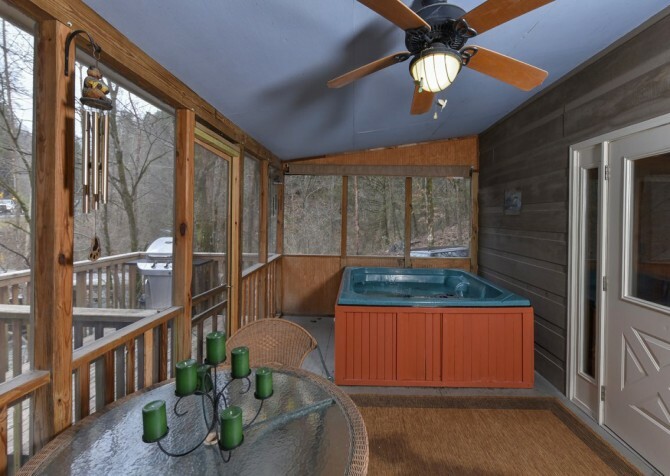 After scenic hikes in the Great Smoky Mountains National Park, ease sore muscles and tired bodies in the bubbling steamy waters of the outdoor hot tub on the covered deck. 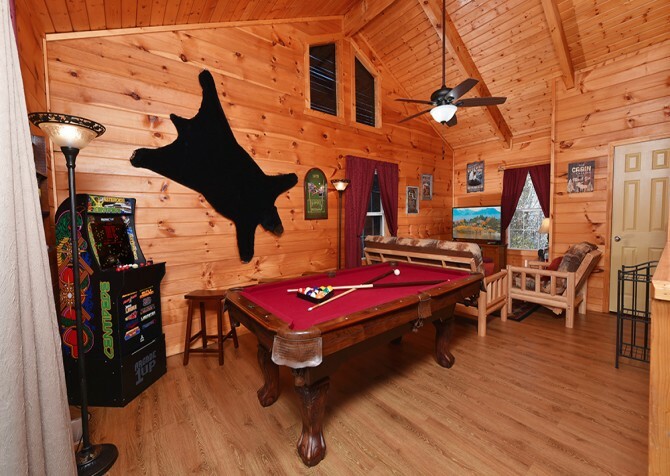 Cabin downtime is well spent shooting pool and playing arcade games in the lower level rec room or finishing your current book obsession in the cushy reading chair in the privacy of your bedroom. The living room is the perfect spot to kick back and relax after daily excursions into Pigeon Forge and Gatlinburg. Spend quiet, peaceful afternoons lounging on the plush suede couches while soft sunlight pours through the expansive windows and you watch your favorite DVD movies from home. Flip through the books from the wooden shelf while seated in the cozy rocking chair by the fire on cool evenings. The area rug is a great space for group games to share laughs before putting the kids to bed for the night. With mountain and wooded views, tons of natural lighting, and faint breezes of the ceiling fan, feel connected to nature right from the living room couch. Spacious countertops, full-size appliances, and loaded with kitchen tools, your charming kitchen makes meal preparations a breeze during your stay in Bear-rific View. Brew fresh pots of coffee and pop English muffins in the toaster for quick breakfasts each morning to help get you on your way to daily adventures in Pigeon Forge. No need to eat delicious dinners with paper plates and plastic utensils; your kitchen is stocked with beautiful glassware and plate sets. The spacious breakfast bar is a great spot to set up a self-serve meal where guests can easily go back for seconds. Store leftovers from large meals at the Peddler’s Steakhouse and the Old Mill Restaurant in the refrigerator and reheat in the microwave for quick and easy snacks the next day. Host lovely dinners around the charming wooden dining set with natural timber accents while the romantic light of dusk pours in through all the windows with mountain views peek through the trees. Clear the table after every delicious bite is finished and pour glasses of dessert wine from the bottles purchased along the Rocky Top Wine Trail. Under the warm lighting of the pendant fixture, share laughs and make some of your favorite memories late into the night playing board and card games you brought from home. Fall asleep in the homey atmosphere of both bedrooms boasting cozy quilts, flatscreen TVs, dressers to unpack your suitcases, and comfy reading chairs with tableside lamps. Escape to your quiet bedroom where you can close the blinds for a peaceful afternoon nap under the soft breeze of the ceiling fan. Enjoy reading a book and the plush armchair while the kids play games in the rec room, reveling in some much-desired alone time with the last few chapters before heading to more adventures with the kids in Dollywood. Easy access to bathrooms makes getting ready for dinners and showering off after hikes much more convenient. 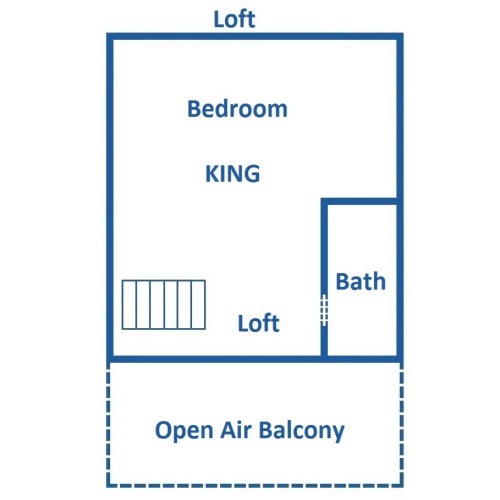 The kids will love having sleepovers in the queen-size bed of their room on the entry level while parents enjoy peace and quiet in the king-size bed of the master suite beyond the open-air balcony. After restful nights of sleep, step out of the loft bedroom to incredible mountain views in the dreamy morning light from the craftsmen rocking chairs on the balcony. 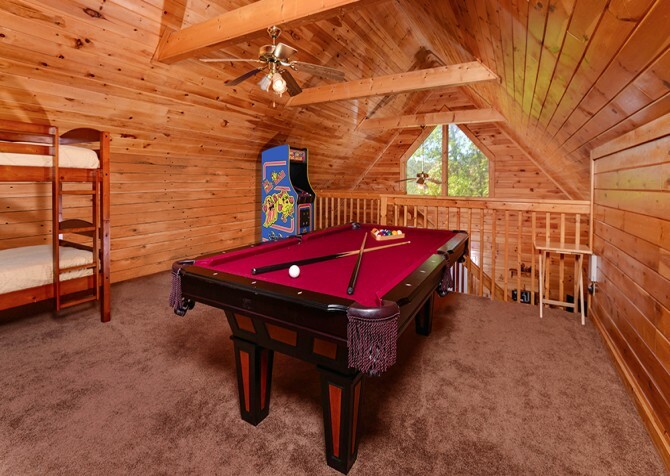 When guests aren’t taking in the surrounding views, shoot some pool and play arcade games to pass the time in the cabin rec room. Pour glasses of crisp local beer from the Smoky Mountain Brewery growler to sip while playing 8-ball or racing against the kids on the authentic arcade system. Step outside to the covered porch to watch serene rainfall over the mountains before stepping back inside to take your turn on the pool table. With incredible views of Mt. Leconte resting in the distance, guests will love spending their time lounging in the rocking chairs, soaking in the hot tub, and walking the family pet outside. Host cabin cookouts on sunny afternoons while flipping burgers on the charcoal grill. Don’t forget to pack outdoor games from home to play on the spacious patio, too! Rain or shine, guests can relieve some stress and tension in the steamy outdoor hot tub under the covered patio as the massaging jet and warm bubbles work their magic. *Parking can be difficult at Bear-rific View, especially during winter months. Please be prepared for steep, curving mountain roads and a narrow and steep parking area. Host to many of the Southeast’s largest seasonal festivals like A Smoky Mountain Christmas and Barbeque and Bluegrass, Dollywood is a year-round celebration of family, fun, culture, and music! In between exciting roller coaster rides, attend theatrical performances, try delicious and savory treats, and visit unique exhibits like the Bald Eagle sanctuary! A perfect, budget-friendly treat for your special someone, a couples’ retreat, or surprise for wine lovers, Mountain Valley Winery is a charming award-winning winery in the heart of downtown Pigeon Forge where tastings and tours will impress; continue the fun with a trip along the Rocky Top Wine Trail! Enjoy some good eating and unique shopping all in one area! The Old Mill Restaurant serves up generous portions and home-style dining. After you enjoy a memorable meal, walk through all the mountain shops where you can find candles, fashion, handmade pottery and art, and delectably sweet candy shops. "Great cabin with wonderful view. Enjoyed the privacy of this cabin. The hot tub was a welcome luxury after a long hike in the smokies. Would recommend." "Stunning view, amazing place to stay! Lots of fun things to do in the cabin and near by." "We recommend this cabin! It has a beautiful view from inside with all the windows to sitting in the rocking chair or hot tub on the porch. We enjoyed our stay and loved the wood furniture. It really put a good touch on getting the full experience of the cabin."